Argus is seeking a stronger brand presence in Malta after renaming Fogg Insurance Agencies. Fogg has been rebranded as Argus Insurance Agencies Limited (AIAL). As part of the rebrand, AIAL will have access to the technical talent and industry knowledge of an International organisation (The Argus Group), with assets totalling $1.9 billion. The Argus Group acquired Fogg Insurance Agencies Limited (Fogg) in June 2010. The presence of the Argus Group in Malta carries numerous benefits to the business community, including access to specialised expertise and knowledge of small jurisdictions and its experience working with the broader community on issues relating to health care, pensions and employee benefits. AIAL will continue to offer its existing portfolio of products which will be enhanced with new product lines in the very near future. Malta Prime Minister Joseph Muscat visited the AIAL office last week to commemorate the rebrand. He said that this development reaffirms Malta’s attractiveness to the financial sector. He noted that financial services account for seven per cent of Malta’s national GDP and this sector employs over 7,000 people. He also noted that the insurance sector has registered an increase in revenue. 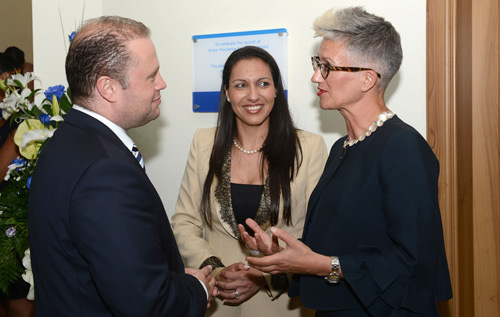 Dr. Muscat said the government will push forward new centres of excellence but it is still committed to helping the financial services sector flourish. He also spoke about the pensions reform and said insurance companies are sure to take up the challenge of upcoming initiatives that will incentivise private pension schemes.